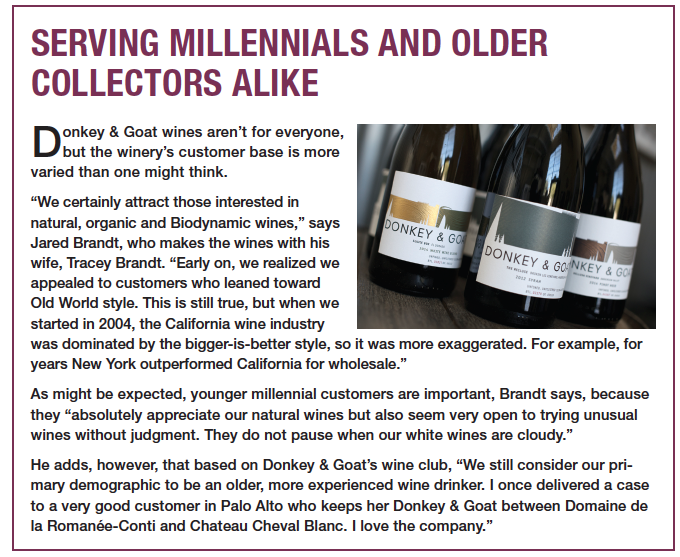 Jared and Tracey Brandt of Donkey & Goat winery in Berkeley, Calif., were working for tech companies in the San Francisco Bay Area when they decided to take a one-year sabbatical in 2001. They loved wine, so rather than simply travel for a year, they went to France to study winemaking under Eric Texier, a respected winemaker in the Rhône Valley and Mâconnais regions who was committed to “natural” viticulture and winemaking. 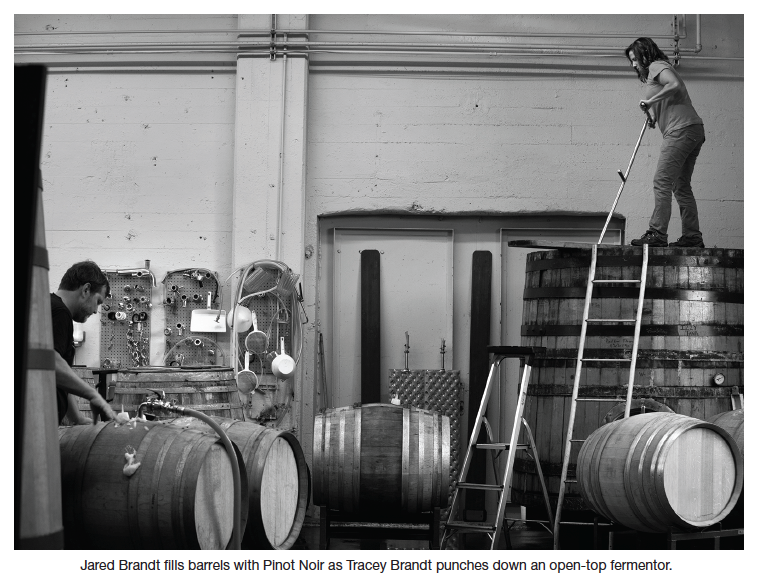 When they returned to the Bay Area, the Brandts found new jobs, but the lure of wine stayed with them. In 2003 they made some wine of their own, but they hadn’t yet secured a winery bond from the Alcohol and Tobacco Tax and Trade Bureau, and the wine was never released. Donkey & Goat was officially founded in 2004, the same year that Tracey Brandt helped start Crushpad, the former do-it-yourself winemaking facility in San Francisco, Calif.
At Donkey & Goat the Brandts followed Texier’s example and looked for growers who were following environmentally responsible practices. Like Texier, they also eschewed commercial yeasts and used minimal sulfur dioxide. 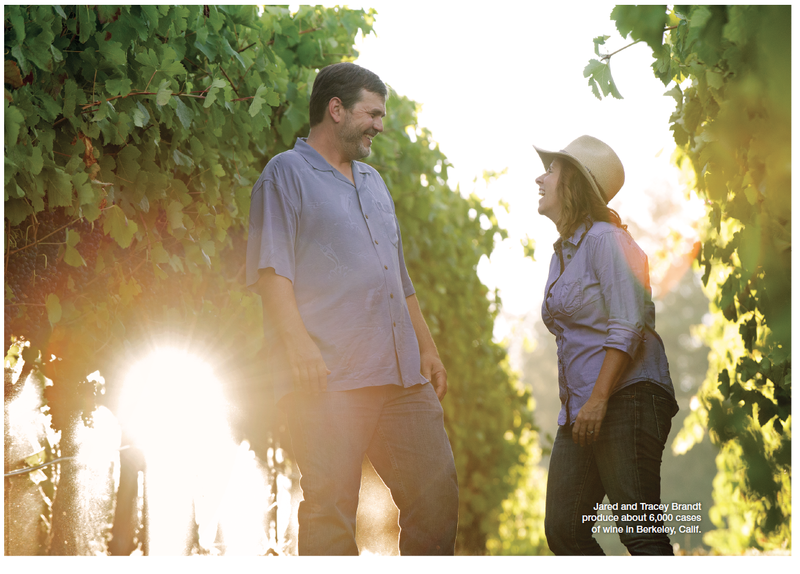 Now based in Berkeley, the Brandts work with California vineyards in Mendocino County, the Sierra Foothills and Napa Valley and produce 6,000 cases of wine with an average bottle price of $30. Their portfolio ranges from skin-fermented whites to pétillant naturels to wines that might be considered more “conventional,” such as Napa Valley Chardonnay and Anderson Valley Pinot Noir (although the latter does use some whole-cluster fermentation). The Brandts are so passionate about their practices that their website even includes a manifesto outlining their approach (no fermentation in plastic bins, for example, and bottling without fining, filtering or cold stabilization). 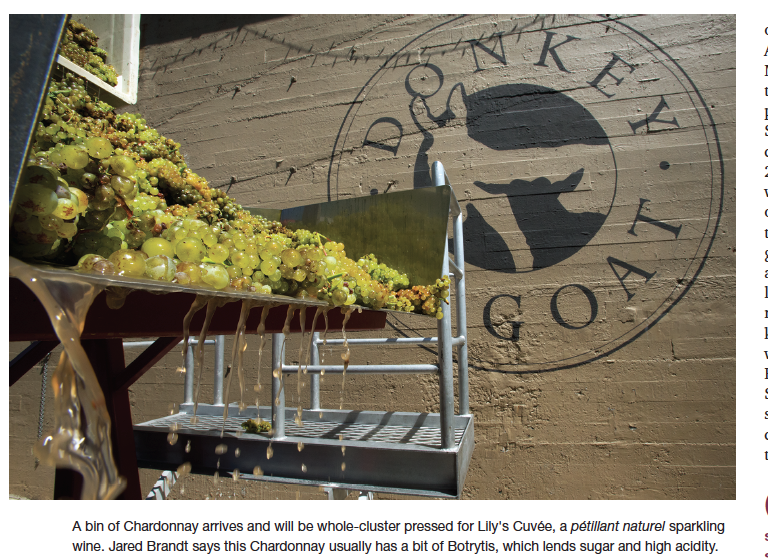 Q At Donkey & Goat, you’ve experimented with fermenting a variety of white grapes on the skins. Why did you want to do this? With which varieties have you had the best success? What problems have you encountered? Jared Brandt: We began experimenting with white wine skin ferments with Roussanne. Today, that Roussanne is our Stone Crusher. The impetus to experiment with skin contact came from our being fascinated with the wines from Gravner, Radikon and Paolo Bea in Italy and wanting to explore how to make such a wine. Plus, we realized in 2006 that our Roussanne was going to prove challenging as it struggled to complete primary fermentation in less than 12 months (a natural fermentation with no additives). We figured the skins would give the ferment the added nutrients it needed, and we could learn. The 2006 Roussanne was among the slowest ferments we have ever seen. It took probably eight months to go dry. We called that wine Tamarindo. Since then, we have experimented with a multitude of white grapes on the skins: Roussanne, Marsanne, Vermentino, Grenache Blanc, Pinot Gris (nearly white), and in 2010 we did try one of our Chardonnay vineyards. We were not happy with the Chardonnay that year, we found that the mineral undertones—I like to think of the smell of rocks when fly fishing—disappeared with the skin contact. Since then we have focused on our Rhône varietals and Tracey’s new (2014) Pinot Gris. However, in retrospect, there were other variables that may have led to our dissatisfaction with Chardonnay, and we do plan to try again. We have had several skin-fermented Chardonnays that are intriguing. Thomas Fogarty makes an interesting and very good one. After 10 years, we have a sizable amount of data and learning. Early on, we decided to minimize the oxidative quality often found in skin-fermented white wines, as well as the volatile acidity. To do that, we protect the grapes with CO2 before fermentation starts and as it winds down. We have experimented with not doing this and have found that even though the fermentation chews through most of the oxygen, it still ends up being slightly oxidative and with higher levels of VA. Tannin management is key, we taste constantly and press before the wine is dry on most skin ferments. We have found that if you don’t press early, you need to wait until the tannins come back down post-fermentation, usually at 50-plus days. We have evaluated the impact of alcohol on extraction of tannins and found that the higher the alcohol, the higher and rougher the tannin extraction. Our Roussanne/Stone Crusher has never been over 14% (alcohol), and since we pick for acidity more than sugar, our Roussanne is picked at lower sugar levels, which results in the more feminine style of skin ferment. Our experiments with stem inclusion have not worked to date. On reds, we are often at 40% to 50% stems, but on the whites, the green, chewy tannins from the stems haven’t worked. It has also been clear over the years that these wines require bottle age to really show their power and beauty. Grenache Blanc can be extremely tannic for three to four years. Once those tannins soften, the wine emerges beautifully. Skin contact, for us, might be the ultimate expression of terroir. In some senses, it is the most minimalistic of winemaking techniques. For our Roussanne, any other winemaking would require more intervention, masking place. These wines also pair beautifully with food. Diver scallops, for example, sometimes needs more oomph than a white, yet need the acid of a white. Q You do at least some whole-cluster fermentation on most of your reds. How do you decide what percentage of whole clusters to use? Have you found any drawbacks or problems? Brandt: We have made red wines with stem inclusion since 2006. Most of our reds include at least 20% whole clusters; we work with up to 50% on the Syrahs and Pinot Noir. 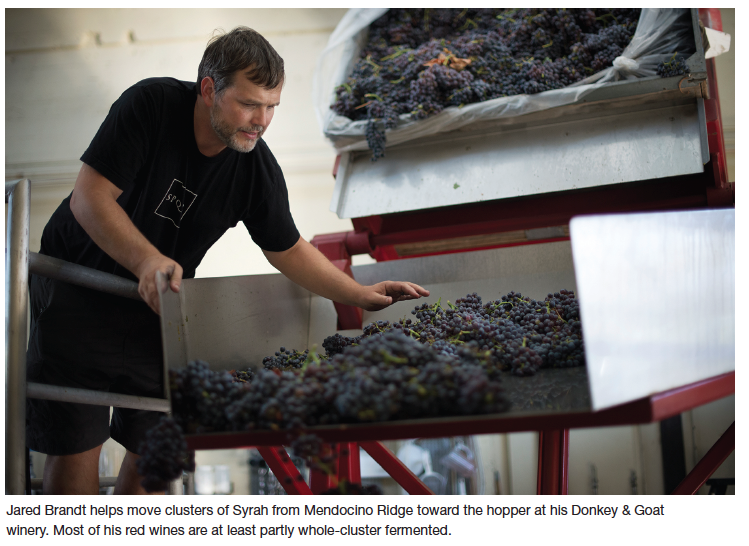 We have experimented with 100% whole cluster on Syrah, but it hasn’t worked well for us. We do not add any sulfur before fermentation. On the 100% whole cluster, the VA levels were too high for us. I am not a fan of carbonic maceration and don’t want to use too much CO2 to protect the grapes. To decide on how much whole cluster, we evaluate the ripeness of the stems, literally chewing the stems bin by bin. If we like the stems, we include all from that bin. We may have an idea from past years of the percentage, but the taste dictates what we do. Stem inclusion does force more time in barrel for some wines. Beginning in 2009, we began pushing the percentage up on two of our Syrahs, the Recluse from Broken Leg in Anderson Valley and Perli Vineyards in the Mendocino Ridge. We went up into the 35% to 40% (stems) range, and we were very pleased with our results. For our El Dorado Syrah from the Fenaughty Vineyard, we had consistently stayed around 20% to 25% until 2013, when Tracey pushed to increase the whole cluster on Fenaughty to 40%, like the other two Syrahs. This was a huge jump from the previous year. That spring, post-malos, our grower, Ron Mansfield, was tasting with us, and when we got to the Fenaughty, Ron and I looked at Tracey and said something like, you ruined the Fenaughty. We were not entirely kidding. The stems were so pronounced that we feared a green profile to the ultimate wine. However, by then we were bottle-aging our Syrahs for eight to 12 months before release, so by the time we released this wine, it was completely resolved and quite honestly one of the best vintages we’ve made to that point. Q You’ve been experimenting with pétillant naturel (pet nat, wine bottled while still fermenting) wines for some years, since before it was popular in the United States. Why did you want to make this style of wine? What have you learned in your experiments over the years? Are there grape varieties that you particularly like? Brandt: In 2008, I had my first bottle of Andrea Calek’s Blonde. This wine stayed with me and led me to seek more, but at the time I didn’t know of any domestic pet nat wines, and there were only a few I found from Europe. In 2009, I decided to try my hand and made our first pet nat from our 1896 planting of Grenache Gris at Gibson Ranch in Mendocino County, which we have made into rosé since 2004. We bottled in 500ml bombers and never disgorged. Each time we opened one, we lost 40% to 60%, but the little that was there was delicious. Plus, many of the caps leaked, so we learned that when hand-capping, after the initial sealing, do a quarter-turn and a second sealing. In 2010, we tried out a new Chardonnay vineyard in the deep end of Anderson Valley that we knew struggled to ripen. This was our first Chardonnay pet nat but not released to the public. In 2011, we made 40 cases, did not disgorge and only sold it in our tasting room. Because we don’t filter or fine or cold-stabilize, the wine had to be disgorged. We included a drawing by our daughter Isabel to explain home disgorging. Some customers loved the hands-on nature of opening the wine. Others mention the lees that still color their ceiling to this day! The wine had been dubbed Ginger since 2010, but in 2011, Lily, our second daughter, was born, and Ginger was no more. Starting with 2012, we disgorged the wine. For us, pet nats deliver a refreshingly delightful experience that is truly alive. We add zero sulfur to our pet nats. We do not use any riddling agents. Our wine is made of grapes, just grapes. Each bottle is different and truly authentic. 2016 will be our eighth vintage making a pet nat and the sixth vintage for Lily’s Cuvée. We continue to refine and experiment. We have also experimented with other varietals. In 2013 we made a Merlot pet nat (Kraisey). In 2015, we made both Clairette (Blanche) and Pinot Gris. These will be released to our wine club during the holidays with an experimental version of Lily’s. Our Clairette and Pinot Gris are enchanting but for a more adventurous palate. Over the years we have improved our production methods. For example, we have discovered that bidules, which are placed under the cap to help capture some of the sediment, and the correct tools make disgorging by hand much easier. I would like to try a disgorging line at some point. Q You’ve tried making wines with no sulfur but, for the most part, your approach is to use minimal sulfur. Please explain your approach. Would you consider trying to make no-sulfur-added wine again? We have experimented with using no SO2 and being below 10 ppm with mixed results, particularly with wines shipped abroad. Sometimes, in the summer, we have seen problems in the United States. These problems have led us to our current levels. This year (2016), we will make Syrah without SO2. I think Syrah’s highly reductive nature will work; we shall see. Q You’re trying to get away from copper compounds used against bunch rot and other diseases in the vineyards you source from. Why? What sort of alternatives have your growers tried? Brandt: We want our wines and the vineyards we work with to be safe and ecological. I have read academic studies on the results of long-term use of copper on the soil and its microbial diversity. For us, this impact is too great to ignore. At Filigreen Farm in Anderson Valley, the grower is certified Biodynamic but uses no copper or sulfur. Instead, he uses stylet oil and baking soda. To date, this has worked. Baking soda (Kaligreen) does have a risk in that if applied too close to harvest, it can bump pH.